"Yummy peanut butter cookies with "cyclops' eye" of chocolate." In a large mixer bowl beat the butter or margarine and peanut butter with an electric mixer on medium speed for about 30 seconds. Add 1/2 cup of the white sugar and the brown sugar and beat until fluffy. Add the egg, milk and vanilla and beat well. In a medium mixing bowl stir together the flour baking powder, salt and baking soda. With the mixer on low speed gradually add the flour mixture to the peanut butter mixture. Beat until well combined. Cover and chill dough for 1 hour. Preheat oven to 375 degrees F (205 degrees C). Shape dough into 1 inch balls. Roll balls in additional sugar. Place about 2 inches apart on ungreased cookie sheets. Bake at 375 degrees F (205 degrees C) for 10 to 12 minutes or until the edges are firm. 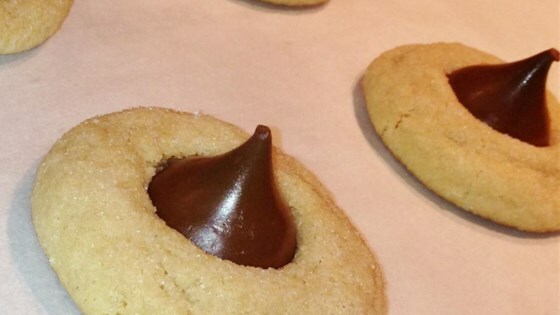 Immediately press a chocolate kiss atop each cookie. Transfer cookies to a cooling rack and let cool. These turned out great! I've never baked before but I followed the directions exactly and they were delicious! I followed this recipe exactly without the granulated sugar and loved them! I may try the sugar for hollidays and special occasions. Excellent!! This is the same recipe we used growing up. Whoever tries these is won over by them! Yum!! I thought these cookies were perfect...I especially liked that they keep a nice puffy shape when you bake them & don't flatten out too much.